Aer Lingus will no longer require female cabin crew to wear makeup - and skirts - as part of their uniform. The airline, which recently announced a brand refresh, will roll out a new look uniform designed by Louise Kennedy. The redesign of the uniform incorporates a number of options including a "trouser option for females" and an "ability to combine collection elements", according to an Aer Lingus representative. Aer Lingus said that they carried out "extensive feedback sessions with staff across many departments" to get the views on the current uniform and to discuss what the new uniform should address "in terms of needs in today's working environment". The representative confirmed that staff will no longer be obliged to wear makeup - which was previously a mandatory requirement. "The new uniform collection was designed in partnership with a number of our staff to reflect changing dress norms and to better meet the needs of our guest-facing colleagues," a spokesperson told independent.ie. "The new uniform collection incorporates a range of wearer options including a trouser option for females and an ability to combine collection elements. 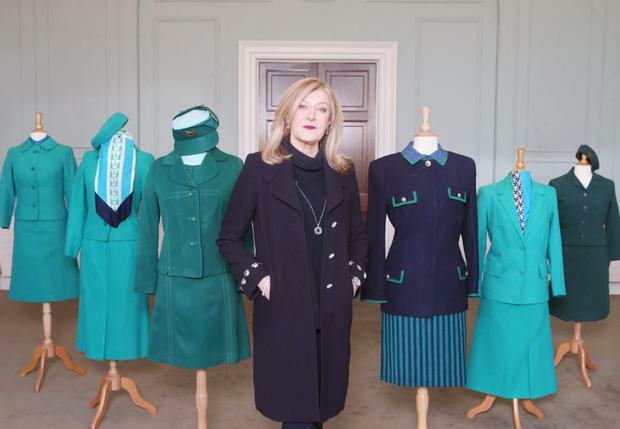 The ‘teal green’ uniform currently worn by crews was also designed by Louise Kennedy and makes history in that it has been the longest-running Aer Lingus uniform – first taking to the ‘runway’ in 1998. A total of ten uniform designs have been created from a host of leading Irish fashion names including Irene Gilbert, Neillí Mulcahy, Digby Morton, Ib Jorgensen, Paul Costello and Louise Kennedy. The first ever uniform was a military-style rich brown suit in 1945, which then became green a few years later in 1948, it was designed by Sybil Connolly of Pimms. Since then, green skirts and jackets, coupled with varying styles of shirts, blouses and quite a few hats.